A new CBS poll finds that Americans are uneasy about North Korea and the president’s fitness to handle the escalating situation there. And a new CNN poll shows Trump’s approval rating dipping to 38 percent. POLITICO notes that the Trump White House is approaching some centrist Democrats as it charts a course for tax reform. The Washington Post notes that Trump’s criticisms of Richard Blumenthal highlight his own lack of military service. NBC’s Ali Vitali reports on Trump’s weekly Facebook broadcast. POLITICO writes that some Democrats are alarmed that Bernie Sanders may have an appetite for primary challenges to moderates who don’t support a Medicare-for-all health care plan. AL-SEN: Chuck Norris endorsed Roy Moore. MO-SEN: GOP state Rep. Marsha Haefner is thinking about getting into the primary. NV-SEN: Danny Tarkanian announced a primary challenge to Dean Heller on Fox News. 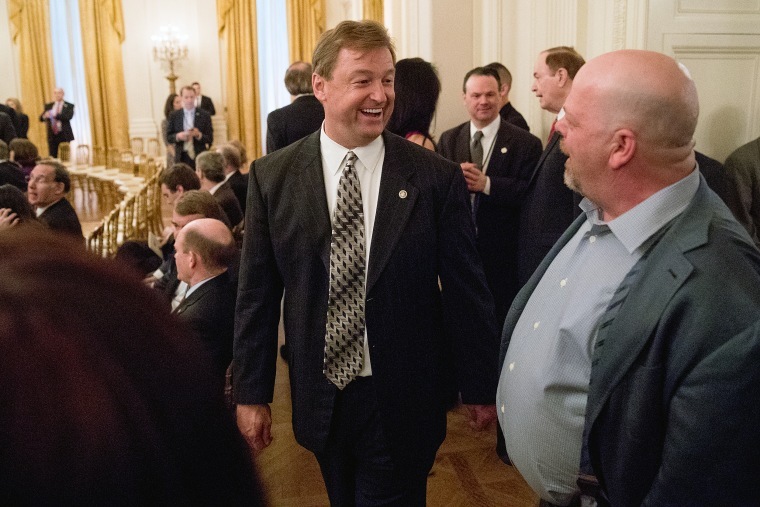 The Senate Leadership Fund says it will spend seven figures to defend Heller. VA-GOV: Ralph Northam is calling for the decriminalization of marijuana. WI-GOV: Democratic state Rep. Dana Wachs says he’s running for governor.